I wanted to build an environmental monitor. Partly to see what happens from day to day and also because I wanted to compare all the different MQ Sensors and see how they respond to different things. Using a Linkit one allowed me to add GPS logging to make this a mobile platform. I've included the SCAD source and STL files if you want to make one for yourself. The Linkit only has 3 Analog Inputs. I needed 9! I added a TLC1540CN 11 Channel ADC Chip from TI. I used an Arduino Mega Prototype Shield. I only populated the pins that matched the Linkit One. I used the other pins for I/O from the chip. I also added an extra I2C connector on the front edge in case I want to add an LCD Later. To make it look nice I decided to mount it to a plaque and make everything visible, well almost. I bussed all the power wires behind the board. I cut a second board to the exact same size so I can sandwich some 1/2 square wood strips to make a box. To make it look nice I decided to engrave all the legends for the plaque on a CNC Mill. A quick shot of black paint to highlight it and a swipe with some WD-40 to remove the excess paint really makes it look nice. The code for the TLC1540 is a little rough. I do a little brute force bit twiddling but it does work. I send all 11 channels from the ADC out to the CSV file. The last two channels are not connected to anything so you get random noise there. I will use them soon. The code logs a file to the SD card with the current date for a name. Everyday its running you get a new file. I may change that to drop the day and just use Month-Year. That way I only get a new file every month. Its a CSV file so I can use Office to manipulate it. A Geiger Counter, Well why not. 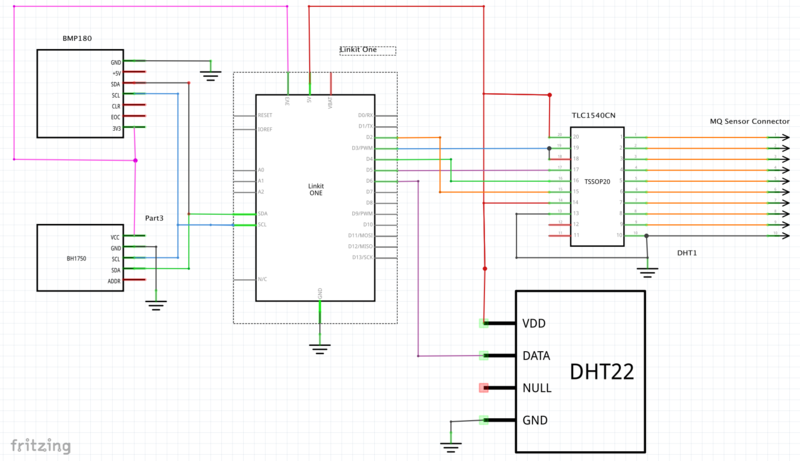 I have to make a PIC micro-controller I2C slave to keep track of the CPM. I might have to cover this part with a Plexiglas shield to keep fingers away from the High Voltage. Somewhere I have a Mica windowed tube too. I might even have a pancake tube in my fathers Army survey meters. I have to go check his footlocker. That way I can compare tube types. There are a few MQ sensors I don't have yet so they're on the list. I picked 5V sensors to make it easy to wire up. I have plenty of area left on that shield for any support circuitry I might need to switch the supply level for the really odd sensors. you must connect Addr pin to A3 . Serial.print(pressure, 2); //whole number only. // Must send in temp in Fahrenheit! *@param dir if true the direction is south, and the angle is negative. *@return the given angle in dd.mmmmmm format.